Wow, today is the last day of 2009 - with that in mind, I thought it apt to post my 2010 budget and financial goals. I've decided that although I'm budgeting $500/month for my student loans - I'm going to leave each auto withdrawl at $75 (for each loan). I will do manual deposits bi-weekly to make my $500/month target. That way - if anything comes up, I'm not locked in. 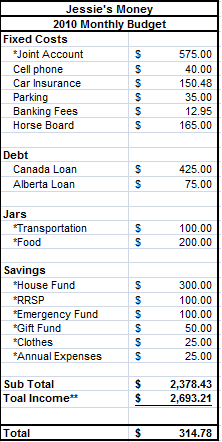 I have a lot of 'savings' categories - however; the only true savings are my RRSP and my emergency fund. Further to that, after I reviewed the comments left on my draft post I added an annual expenses category. I have about $300/month left over which is about pefect. You'll see once I start posting bi-weekly budget's I don't actually use that much for entertainment/other - it just gives me some flexiblity. It was a pretty stressful year having every penny accounted for - this provides me with a bit of stress relief. You'll see that the timeline is over a year in each category. After doing a little number crunching, I figured that i'll have to come up with an additional $2,500 and change in lump sum payments to reach these goals. I think that this is completely do-able. I should note here that Jordan and I are each contributing $150/bi-weekly to the house down deposit fund. My student loans are listed here, as well as Jordan's truck loan. One of our major goals this year to is to wipe out all of our debt! You can see that it will take about half the year to pay of my Canada Student Loan, after that, I'll roll the $425 over to my Alberta student loan. To pay off my Alberta Student Loan in the second half of the year, I'll have to come up with an additional $2,000. So that's it - my budget and my/our financial goals for 2010. To make it all work, I'll have to come up with an extra $4,500 this year. I'm hoping to accomplish this through my 2009 tax return, two 'extra' pay days this year, bonus' at work and making more money! I'm loving this whole vacation thing that goes along with having a 'big girl' job. Love it! I took off four days this week - so I left work at noon on Christmas eve, and don't go back to work until January 4th, 2010. Pretty Sweet. We're back in the city now as Jordan had to go back to work yesterday, so i'm just enjoying relaxing at home - having the place to myself. Speaking of having the place to myself - it's about to end. We wound up finding a new roommate at the ninth hour (those who follow me on twitter probably already knew that). We are still trying to settle the damange deposit and final utilities with Jeff, who's being difficult, but hopefully that will be resolved in short order. New roommmate B-rad, picked up a key yesterday and is planning on moving everything in today at about 2pm. B-rad wrote us a cheque for his first months rent and half his damage deposit, and next month he'll write one for rent and the rest of his damange deposit. A fair arrangement I think. Wow, it's Christmas Eve tomorrow - and it happens to be pay day. It would have normally fallen on December 25, 2009 - but they are bumping it back a day. There are a couple of fantastic items on this bi-weekly budget. First up, my pay is the highest it's ever been! This is because I met my CPP and EI maximum contributions!! So I had just my tax deducted (32% marginal tax rate) and my share's deduction (I'm saving to buy shares of the company through our payroll deduction program). I got a BONUS!! which is amazing! I guessed I would take home $385 of my $550 bonus, it was actually $374. Still pretty good I'd say. And wow - this blog actually made me some money this month - wahoo! this is a big thanks to all of my readers and to The Debt Ninja who helped me negotiate this fine fee! My RRSP and Emergency fund contributions are exactly what i'll need to meet my $3,000 RRSP goal and my $1,000 Emergency fund goals - yeah!! I've written a cheque for my horse board, Starlight's on full feed during the cold winter months - so my rate increases to $165 from $90 in the summer months. I've alloted double what I usually spend in gas b/c - hey it's Christmas and I imagine doing a lot more driving around the normal - though I'm taking advantage of Shell's pretty sweet Air miles offer I got in the mail. After all that, I still have $440 left over!! Wow! yea! Some of that will go to driving to my home town, but I don't think too much will. Let's say I have $400 left to work with - what should I do with it? oh, and for new comers - things are highlighted in green if I've already written a cheque or the money has already been transferred. It basically is an indicated for me that I don't have to take any action on it. December sure has been a difficult month to find a roommate. We have had a couple lined up and then they have both backed out - each time someone commits, we stop looking - which has wound up wasting our time. Someone is coming by the place tonight after work - and sounded (as much as one can sound via e-mail) enthusiastic about the place. This one, we'll call B-rad, wants a place for January 1st... so he's cutting it pretty close - maybe that we'll work in our favor. When prepaid debit cards began to appear a few years ago, many were skeptical about their use. Why would someone want to take the time to load money on a card when they already possessed a debit card connected to their checking account? However, as time went on, the obvious advantages that prepaid debit cards offer to consumers began to come to light. Leading the list of reasons to obtain a prepaid debit card is the fact that they will never lead to overdraft fees, because they can only use the amount that’s available on the card. Which is why overspending that triggers an overdraft fee becomes impossible. Today many banks are losing money due to the poor economy and increased regulation. To make up for these losses, most are adjusting their policies to make an overdraft fee more likely, while significantly raising the associated penalty fees. Most consumers don’t realize that debit cards connected to checking accounts usually come with automatic overdraft coverage, which means that a charge will be paid by the bank, rather than be refused. Banks may market this as a convenience for their customers–a wonderful benefit that means their customer’s card won’t be rejected at the checkout counter–but the hidden danger of that policy is the high overdraft fees that occur with each purchase over the checking account’s balance. Poor budgeting or faulty math may lead to overdraft fees that can add up in a hurry. It’s like bouncing a check every time the card is used when no funds are present to back the purchase. Consumers are waking up to the realization that the overdraft protection is not an outgrowth of their banking institution’s altruistic attitude, but may be a savvy way to increase profits. It is well documented that banks earn millions of dollars from overdraft fees each year. Prepaid debit cards are increasing in popularity with consumers who have been burned by excessive overdraft fees. In addition, they like the built-in budgeting protection that a prepaid debit card affords. Users are able to preload the amount they want to the card, with the assurance they won’t overspend their budget when their record-keeping fails. The consumer who knows their tendency to overspend is able to prevent in advance binge buying and non-planned sales fueled by emotion rather than common sense. Using a prepaid debit card to assist with good budgeting while putting an end to high overdraft fees is a dynamic financial combination more consumers are choosing every day. Jessie's Note: Have you ever used, or known someone that used pre-paid debit cards. This is a service that I have never utilized before. I wonder if it would work for loading ones 'jar money' onto it for people who don't like carrying jars/envelopes around. I’m entering into the ninth hour for my overtime project. As of the end of today, I have logged 54 hours of overtime, which is 72% of my goal. To actually reach 75 hours, I would need to put in 21 hours between 5:00pm today and noon on Christmas Eve. Well folks, that’s just not going to happen. I’m going to work normal hours next week (8:00am-4:30pm), and just enjoy the week leading up to Christmas. I’m not going to go home fatigued and with headache from staring at the screen so long. I’ll just keep plugging away at my project at work, and when I get there I get there. It will likely be in the first couple weeks of January. I'm starting to get this itch, it happens ever year. A week or so ago I posted my final Christmas Spending Tally, signifying that I was indeed finished spending this Christmas. A couple of days ago, the last item that I ordered online finally came in the mail - another indicator that I was finished. I can feel it building inside me. I want to do more, get more, spend more on the people on my list. There are a few things in particular that I really want people to get for Christmas. I've been reaching out to see if others are getting these items for them - but if they don't, I fear I will break out the proverbial cheque book - and just keep shopping. denied... no CHRP for me in 2010. I recently wrote about my desire to achieve my CHRP designation and my application to receive an award through work that would pay for it. On behalf of the Regional Directors and the Continued Learning Awards Review Panel, we would like to inform you that your application has not been retained for a Continued Learning Award for 2010. Thank you for your interest and we appreciate the efforts put into your application preparation. We also wish you the best in the continuation of your program. You will receive an announcement letter in the mail in the next week. If you have any questions, please contact the CLA Review Panel member for your region. Unless I come up with $1,500 on my own, it's not in the cards this year. My company's Christmas bonus is actually an annual profit sharing award. The better the company does, the better the reward. I won't get into all the details - but I will say that not everyone gets the same amount. There is a portion that is similar for everyone, a portion that is based on your group's performance and a portion that is merit based. You can receive any combination of the three financial awards. Often, your award is pro-rated based on the length of time you've been with the company. So if you've been here less then a year, you won't get a full share. That was me last year - I think I got around $70. The company didn't do as well as we would have liked, but we didn't go belly up either. My profit sharing/merit award is for a total of $550 (less all statutory deductions). If we assume i'll be taxed at about 30%, I'll receive about $385! I'm please to say that for the week ending Friday December 18, 2009 I managed to bank 10 hours (which means I worked an extra 12.50). My OT is coming right along, and I still have a lot of work to do! That brought my total banked time up to 47.50 hours or 63.33% of my goal which is an approximate value of $665. I don't know if i'll reach my goal of 75 hours before the end of the month, but I'm still working towards it. I've been thinking about getting an RRSP loan for quite some time now. Now that we're getting closer to tax time, I thought I would take a deeper look at my options. For this exercise, I'm going to look at ING Canada. My 2009 contribution limit is $13,116 - and I've contributed somewhere around $1,000 this year. I would like to 'catch up' and use my previous contribution room. For this exercise, I will look at the cost/benefit of borrowing $10,000 and $5,000. Currently, ING offers and RRSP loan at 4%. You can pay back this loan in 12 payments over 1 year, or wait 3 months and repay the loan in full in 9 months. If I took 12 months to repay the loan, the payments would be $851.50/month. I would pay a total of $217.09 in interest. If I choose their 9 month option, payments would be $1,140.85 and I would pay a total of $267.88. If I took 12 months to repay the loan, the payments would be $425.75/month. I would pay a total of $108.56 in interest. If I choose their 9 month option, payments would be $570.43 and I would pay a total of $133.94. So that's what it would cost, what would I gain? I used HSBC's online calculator to determine how much of a tax return I would get on the contribution amount, and how much the monies would be worth at retirement age. HSBC's calculator guesses that $10,000 deposited now would be worth $14,802, assuming an annual return or 4%. So, $4,802 less the cost to borrow ($217.09) results in a net increase of $4,587.91. HSBC's calculator guesses that $5,000 deposited now would be worth $7,401, assuming an annual return or 4%. So, $2,401 less the cost to borrow ($108.56) results in a net increase of $2,292.44. Note: HSBC's calculator assumes that you would pay back the loan with any tax refund you received (which I would do), the ING calculator did not tell me how much (about) the tax refund would be - so that was not calculated into the repayment schedule. From what I've looked into, it clearly makes financial sense to put more away sooner rather then later for retirement, and if you pay back the loan within 12 months (some of Gail Vaz-Ozlade's financial wisdom) - the cost to borrow is relatively low to the gains. .. so what am I going to do? As Jordan and I have some significant other goals this year (debt and house fund) - I don't think I will take out an RRSP loan this year; however, next year - look out! I believe it will be a 2011 goal to max out my retirement savings. This past weekend Jordan and I helped a couple of people move. We worked our tails off on one of the coldest days of the year (-35 degrees celcius) for $15/hour for 8.5 hours. We each took home $127.50. Not bad for making a little extra cash over the holidays. I tucked some of it away, but that night we went to Jordan's work Christmas party and so we spent some on drinks and what not, I had also spent some cash on long underwear so I wouldn't completely freeze. This was also a big grocery/personal hygiene week and Jordan's got to renew the registration on the truck - so with all that, the extra cash sure is nice! I had planned to put a few extra hours in at work on Sunday, but our bodies were just wrecked from the day before. I did get a lot of gifts wrapped though. My parents came into town last night to get their passports sorted and to finish their Christmas shopping. They took me, Jordan, Brother, and his girlfriend all out for supper - it was such a nice treat. It was great to have all of us together like that. They actually drove out (before we met for supper) to see where my horse was, and it sounds like their happy with the place I chose for her. I'm really glad about that! Hello Friday - we meet once again! Items that are highlighted in green have already happened, things that are written in green are automatic transfers that haven't yet happened. My pay is a little higher then expected because for the first time ever I hit the maximum EI contributions. I haven't it the max for CPP yet, it might happen for the last pay in December. You'll probably notice right off the bat that I was -$211.10 in the hole. I can only say that it was the result of really poor planning. I'll get dinged for an overdraft charge, which hasn't happened for a great many number of months - but it's unlikely to happen again. In a move to reduce the number of transactions I have each month (so I can hopefully eliminate some damn bank fees), I have one ING transfer going through for $70 to a new savings account I have w/ them that I will call my landing account. I'll will divvy up the money in the landing account every other Friday (that's not a payday). I'm going with $100 in my entertainment/other account again to see how well that works out. This pay I actually have to pick up some things for the fish tanks, so we'll see how long it lasts. Food, transportation, and joint account are as per usual. I did a little online shopping (among regular shopping) which I used my visa for, that combined with my cell phone bill results in a $300 transfer to that card. I was going to stick with the normal $90/month for my horse while she's on pasture, but with the heavy snowfall and very cold weather, I'll be moving her to full feed (hay, twice a day). I owe her boarder an extra $55 this month. Finally, i have a savings account w/ my main bank that I raarely use. I've decided to start putting my 'left overs' into this account. My money that has no job yet. I think this will be my student loan lump sum fund - unless other things come up. Seeings as it's Christmas, I'll probably wait until February before making a transfer. This will also help cover things if new roommate doesn't move in (I'm sure he will - but I'm a just in case kind of planner). Well, that's it for the next couple of weeks. Have a great weekend! I have been asked by a few different folks lately on how to create the tracking bars I have on the right side of my blog. I'm very pleased to be able to explain how to set these up, as this was one of the first things I wanted to do when I started my first blog. My blog is hosted using the blogger platform. It's free, by google. If you don't have a blog already - your first step is to create one. It's a fairly easy process, and blogger guides you through it. Once you've got your blog set up, you can edit it using the page elements section of your account, or by edititng the HTML. HTML is the language that creates everything you see on the world wide web. If you are not very familiar with HTML, I would suggest starting by editing the page elements - it will be much easier. There are a lot of ways you can customize the tracking bars to suit you and your blog's needs. You can change the colours, size, your goals etc. The numbers that start with a # sign indicate the colours. If you want to change the colours, I suggest googling HTML colour codes. Through trial and error - you'll find out the perfect combination for your , blog. The numbers that are followed by a px (pixels) are what makes the tracking bar it's particular size. Again through trial and error, you'll find what fit's best. The first percentage that you see tells the tracking bar how much of it should be filled in with the colour you've chosen. The second percentage is the number that shows up within the bar. I keep these numbers the same for obvious reasons. Well - there you have it, I hope that helps. If you have any questions - leave me comments and I'll do my best to help. If your a reader with advise, please leave a link and I can add it to this post. I can hardly beleive it. Four people had responded to our ads thus far and we had set up two viewings, one yesterday and one this evening. The one yesterday went fairly well. He was a little concerned about the amount utilities are each month (i think he lived in a condo before), but other then that - things went really well. We had some really steller weather tonight (and I say that with a heavy sarcastic tones - we got another 6-8 inches of snow) - so viewing number two cancelled. Well right about the time we're sitting down to watch Bones - viewer number one gave us a call. He's given notice with his roommate and wants to move in on January 1st!!! Jordan was the one on the phone with him.... him...he need's a name - let's call him - James - so Jordan is on the phone with James and confirms that he's fine with $500/month in rent and $500/damage deposit - he is - it's great! Yay! We can go on with our house fund as planned - this is fantastic news. It wasn't even that hard! Our budget (me and Jordan) for this Christmas was $1,000 on gifts. We had a total of 24 people (or groups of people in some cases) to buy for. Whoa! On the surface, that seems like a lot of people. Well, maybe it is - maybe it isn't. This year, Jordan and I decided to do all gifts as joint presents from the both of us - so our list got bigger (because there was one, not two) - but the overall spending went wayyyy down. We through in three birthday's into this budget (my brother, my grandpa, and one of Jordan's folks). We spent an additional $337 on decorations and incidentals and $63.82 on GST. So, in case you don't want to do the math. Jordan and I have spent $1,340.17 on Christmas - or $670.08 each. Considering that last year I spent just over $2,000 on Christmas BY MYSELF - I would call this a success. I actually think this is a success (although I fear some reader's will think it's not). Jordan and I have the money, and didn't go into debt for any of our spending this Christmas - and that's a thing worth celebrating. I should also mention that the numbers above do not include any spending we did or will do on each other. This wasn't part of our joint Christmas budget. I won't get into details because Jordan reads this blog, but I will say that I didn't go into debt for Jordan's gifts either. That money was from my entertainment budget and Christmas fund. - oh, and it feels sooooo good to be finished Christmas shopping already! A couple of days ago I mentioned that our roommate is moving out. Joy. I want to thank everyone for all their support as we go through the roommate finding process once again. It will be a challenge - but we're up for it. One reader, Manshu, asked if we have so much trouble with roommates (which it seems we do lately) - why don't we try moving, and renting some where cheaper. Well, there's a few reasons for that (I responded to his comment, but I thought I would post it here as well). Jordan and I can handle $675/month each (although we would prefer not to - which is why we look for roommates). and finally - when my brother moved out a few months ago, we spent a lot of time looking for a new place to see what was available. We didn't find a thing that fit our needs and our budget as well as this place does. We're lucking out a little bit because December Jordan get's three pays, but our deal was that we would make the 'extra' payment into our joint account - sticking to the bi-weekly schedule. We have enough money in our joint account (including what's there now, and the next four payments before January) to cover Dec/January's Rent, paying Jeff his damange deposit back, and paying all utility bills owing for November's usage with about $200 left over. Come January, if we haven't found a roommate - we will have in increase our bi-weekly joint house account contributions to $437.50 from $287.50 - that's a $150/bi-weekly increase. That works out to $875/month/each to cover rent, utilities (gas, water, electricity, recycling etc), TV, phone, & internet. Another way to see that is $1750/month total ($1350 rent and $400 bills). The increase of $150/bi-weekly is effectively, our house fund. I did round up when guessing what our utility bills will be - because it's only going to get colder - but after a month on our own we could re-asses to see if we need to be stashing $400/month for bills. It seems a little high, but I would rather error on the safe side which will just build us a buffer if it's not accurate. I'm going to wait before changing the 2010 budget until closer to the end of the month - when we know if we have a new roommate or not. What are you going to try to accomplish this month? We're almost finished! We have three people left to buy for and then each other! It would seem, that once again, that Jordan and I need a roommate. Last night roommate gave his notice. He has a friend in need, and he's going to move in with her to help her out. I'm tired and frustrated - didn't sleep well at all. Everything was just humming along - and now we have to try to find a roommate over Christmas/News Years. I think the chances are slim to none, Jordan thinks we should stay positive because otherwise we'll be grumpy and without a roommate. He also said we set ourselves up to fail if we think we won't get a roommate right off the bat. He makes a couple of good points, so I'm going to try to stay positive. I posted our old add (that got us this roommate) on Facebook, and will put it out to a few other places as well. How Much Does Your Christmas Tree Really Cost? Real or fake - do you know how much your Christmas Tree really costs? Growing up, my family always went out to my grandparents farm and cut down a tree for Christmas. After I moved out and had my own place, I continued to have live trees each year - as I'm now a good three hours from the farm - I buy one. This year, Jordan and I bought our tree from Super Store. They had a save double the GST day last weekend - so it wound up being $38. It's a beautiful tree (see left) ! My parents on the other hand, have moved to a fake tree - it's something my dad has always wanted because he didn't like the mess a tree makes. I believe mom got it at Costco for $150-$200. One argument is that mom & dad (and everyone else who gets a fake tree) will be able to use it year after year - that's true. For a great many years they will be able to enjoy the same one whereas Jordan and I will have to purchase a new live tree each year. After 4 or 5 years the fake tree would have 'paid for itself' so on the surface, it would appear that we should buy a fake tree. One, I'm a traditionalist to some extent and going out and getting a tree (even from a store), sawing of the base, setting it up, the smell, the mess is part of Christmas for me - I love it all!! Two, I would argue that it actually costs more to have a fake tree. According to an article written on about.com (and something my aunt told me this past weekend) fake trees are made with polyvinyl chloride (or PVC, otherwise known as vinyl), one of the most environmentally offensive forms of non-renewable, petroleum-derived plastic. ...several known carcinogens, including dioxin, ethylene dichloride and vinyl chloride, are generated during the production of PVC, polluting neighborhoods located near factory sites. Most of those factory sites are actually in China, where 85 percent of the fake trees sold in North America originate. Labor standards there don’t adequately protect workers from the dangerous chemicals they are handling. Now - there is a downside to purchasing a Christmas tree like Jordan and I did. Often, these trees have been treated with repeated applications of pesticides over their typical eight-year lifecycles. Therefore, while they are growing--and then again once they are discarded--they may contribute to pollution of local watersheds. The plus of going out and cutting down a tree yourself, like we did when we were little, is that they won't have been treated by pesticides (at least if your getting your tree of my grandparent's farm). Beyond the run-off issue, the sheer numbers of trees that get discarded after every holiday can be a big waste issue for municipalities that aren't prepared to mulch them for compost. However; if a city/town is able - these trees can be composted/recycled - which fake trees cannot (at least that I am aware of). So...Do you know how much your Christmas tree costs?